This started as a tiny platformer I was making over the last few days, and I was thinking ehhh I'll keep it really small and tight. It got slightly bigger, but still didn't get so big as to become unmanagable. It also got an extra coat of polish, somehow. I think that was pure accident. But anyway, here it is. It follows the story of a girl stuck in another dimension trying to get out. 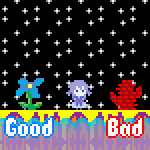 It uses some old sprites that I also had half-baked ideas for. It's got 4 levels, and makes heavy use of a mechanic called "air walking" which I was going to use in another game that I also didn't finish, so I thought for a long time that I wanted to give it a proper outing. The mechanic involves running off edges, and being able to float in the air for a split second. Think Wile E. Coyote running off a cliff. It also makes a satisfying "pop" noise like a gas stove clicking on.